Do You Have Questions Or Need Our Services? The septic tank is basically an on-site sewage treatment and disposal system buried in the ground. The septic system consists of the septic tank and a soil absorption area. Customers can sign up for reminder letters to keep their septic system on a maintenance schedule. 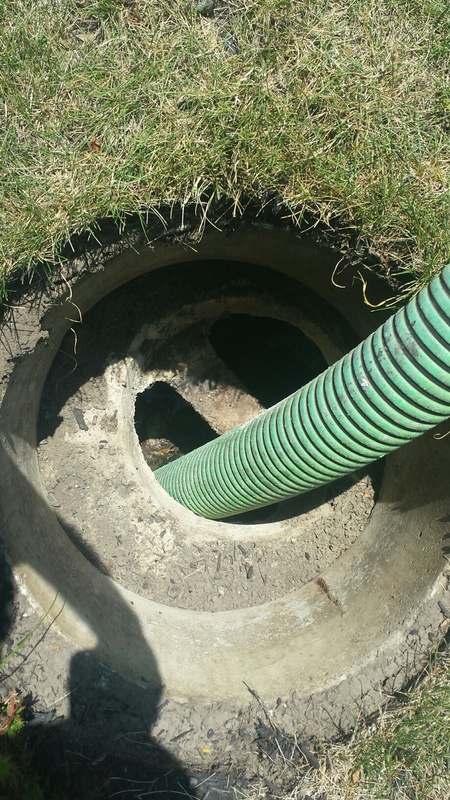 Septic systems should be properly cleaned every 3 to 5 years depending on size and usage. A real live and living person will answer your call. Modern, maintained and reliable equipment. Subsurface Sand Filter: As the water flows out of the septic tank, it enters a distribution box, out of which several tiles are placed. The water flows equally to these four tiles, which are perforated. The water then flows through the holes in the tile into a layer of approximately 2 feet of filter sand. Gradually, beneficial micro-organisms help break down the wastewater further. The sand also acts as a clarifier of the water. By the time the water filters down to the collection tile at the bottom of the filter, the bacteria and suspended solids have been greatly reduced. Leaching Tile Fields: These tile fields are used to disperse the liquid portion of household sewage into the soils surrounding the home. Typically, 8-12 lines or “fingers” are trenched into the soil near the house. These lines may be over 100 feet long and they contain perforated plastic tile that is surrounded by 12 inches or more of gravel. Under ideal conditions the water fills the gravel trench and is absorbed by the surrounding soils. When functioning correctly, these systems do not discharge any water into the surrounding streams, tiles or ditches. Leach lines can often be located by identifying heavy, green growth of lawn grass in the yard. Aerator: Home aeration systems are basically large city treatment plants that have been “miniaturized” to treat individual household sewage flows. These units use an electric motor to blow or stir air into a sewage filled holding tank. Highly efficient aerobic bacteria then consume the human waste and reduce organic material and disease causing bacteria. A specially designed filter then removes any remaining solids before the treated water is discharged into a tile, stream or drainage ditch. While somewhat expensive to operate and maintain, these systems do a good job treating the sewage waste. 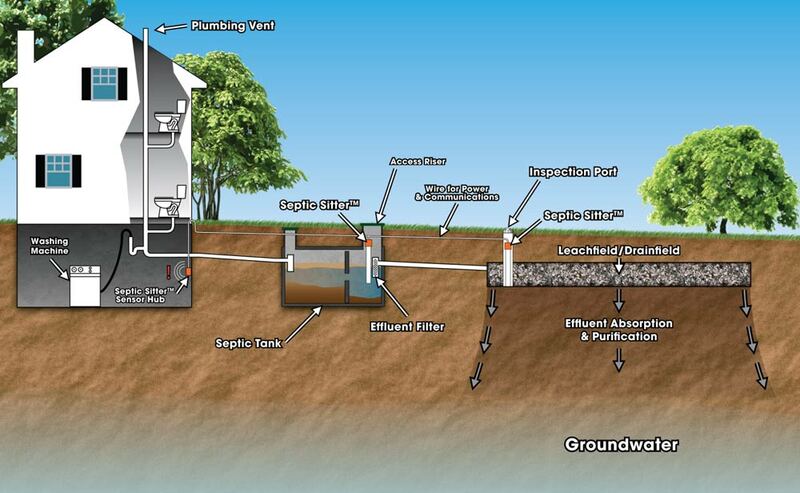 Mound Systems: After leaving the septic tank, the effluent is pumped from a dosing chamber to the mound. The mound, as the name implies, consists of a certain type and size of sand mounded on top of the natural soil. This helps treat and dispose of the septic tank effluent. A layer of gravel is placed on top of the sand. Next, the gravel is covered with construction fabric followed by a layer of soil placed over the entire mound. The soil layer is to protect the mound from freezing. Planting grass on top of the mound is necessary to control erosion. However, trees or any woody plants should not be grown on the mound to avoid root damage to the pipes in these distribution systems. These systems typically cost about twice as much as the systems discussed above, but in areas with inadequate soil depth or other limiting factors for conventional systems, the mound system can be a good and sometimes the only alternative. Heavy duty septic risers and lids are available for your tank. You will be able to mow over the lids without breaking them. No need to trim around the lid. No tripping hazard. Access your tank anytime using a shovel to pry the lid up. No need to dig through frozen soil. Lids are heavy enough not to blow off or need screwed down. No special tools required. Riser tube is a dual wall heavy grade plastic that won’t corrode. An economical price also. Regular units/with hand sanitizers: Great for weekend parties, auctions, weddings and community picnics, these like new units include purse hangers and a shelf. Most units, when available, will have mirrors. These units are delivered to your location with the necessities and are supplied with ample amounts of deodorant to control offensive odors. Handicap units/with hand sanitizers: These units come equipped with the same amenities and supplies as our regular units/with hand sanitizers. Usually reserved for weekend events, these like new units make facilities available for those with particular needs. Construction site units/with hand sanitizers: These units are often on-site for extended periods of time. Cleaning is scheduled weekly or every other week, depending on the average number of individuals on the job site per day. Larger projects with numerous workers or multiple contractors on-site require rental of additional units. Servicing of these units is done on a particular day of the week, with the exception of weeks in which a holiday falls or extreme weather conditions force us to change the route for that week. Some route changes may rarely occur during extremely busy rental seasons. We make every effort to maintain the same servicing schedule whenever possible. 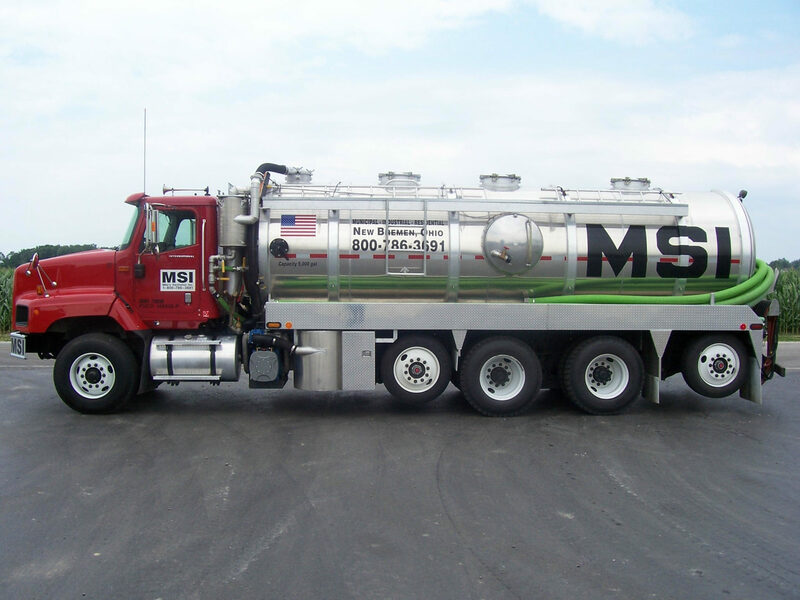 At Mike’s Sanitation, Inc. we are licensed and insured to pump municipal, industrial and residential grease traps and dispose of the contents at our EPA approved wastewater treatment facility. If questioned about their disposal practices, our customers can confidently say “M S I”. We can give you our recommendation on an appropriate maintenance schedule for your needs and follow through with routine maintenance service. 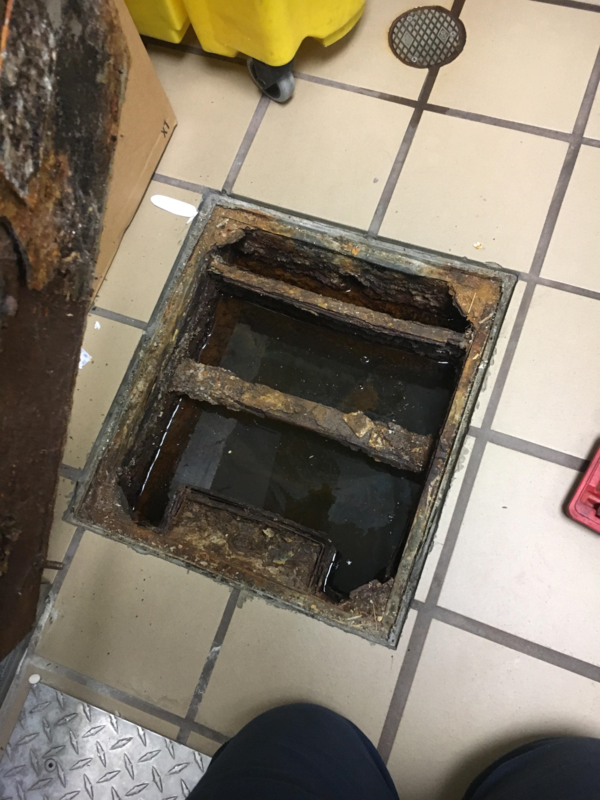 The grease trap in these photos is a small inside grease trap. 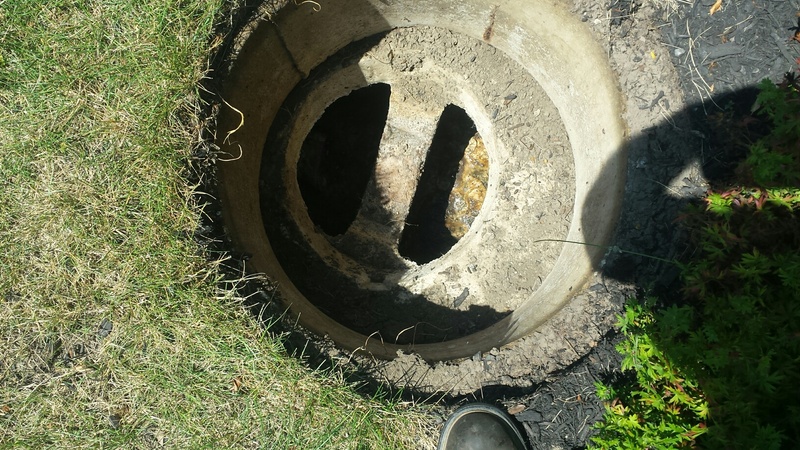 Many times these traps are not adequately effective to keep grease from entering a sewer line. Larger outside grease traps are generally much more effective and reliable. Big or small, all grease traps require routine maintenance pumping. How often depends on the size and utilization of the grease trap. Bigger grease traps may require less frequent maintenance pumping, making them more cost effective and a much better choice. Restaurants, cafeterias, hospitals, hotels, clubs, factories and other commercial or institutional kitchensRestaurants, cafeterias, hospitals, hotels, clubs, factories Food and meat packing and processing establishments, supermarkets and bakeries. Grease traps generally range in capacity from 10 gallons to 1,000 gallons or more. 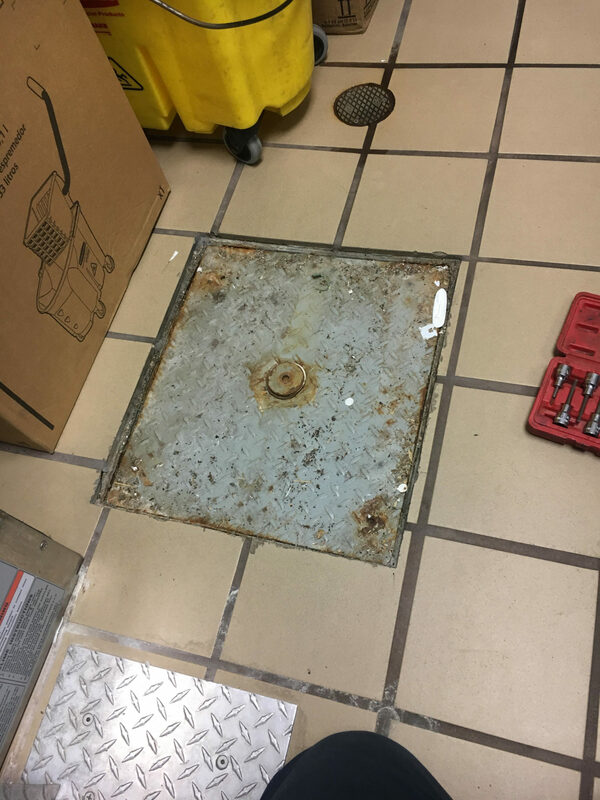 If a business is equipped with a small, inside grease trap, we recommend switching to a larger, outside grease trap. 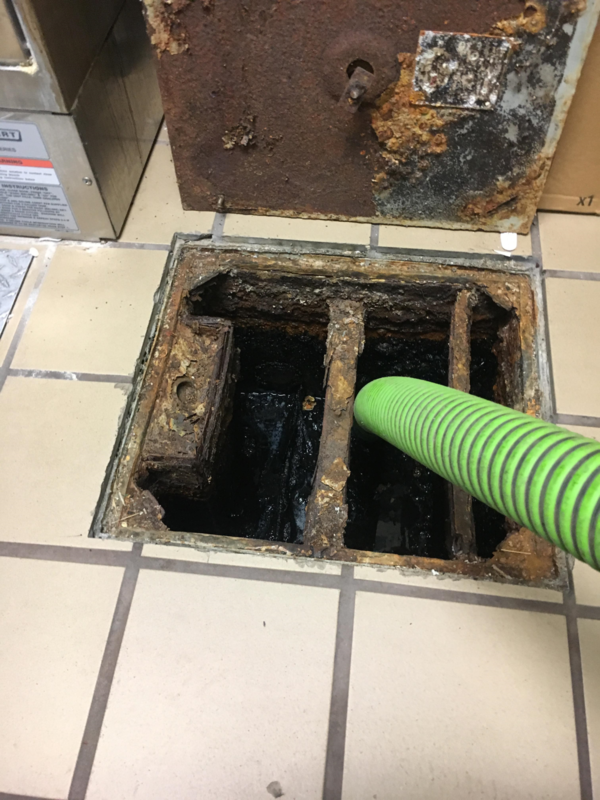 Small, inside grease traps require frequent cleaning, are often hard to access and can be a source of foul odor. Many times, they are not adequately effective to keep grease from entering a sewer line. Larger, outside grease traps are generally much more effective. All grease traps require regular pumping maintenance.Commercial grease traps are designed to do as the name implies. 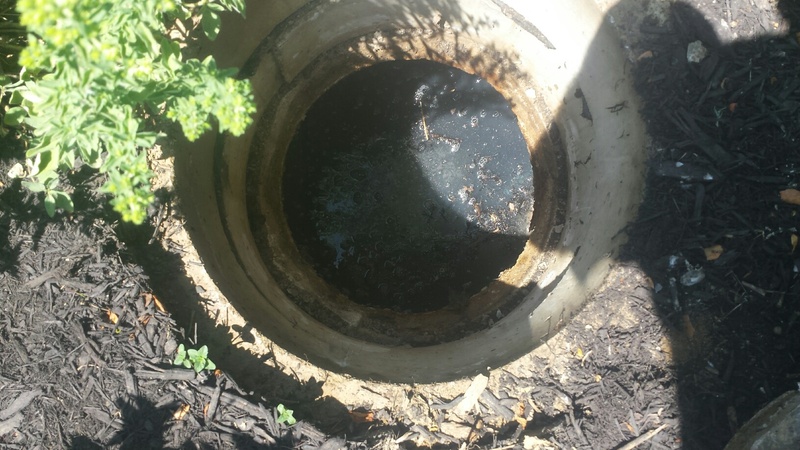 When adequately sized and maintained, they trap grease, keeping it from entering the municipal sewer system. Municipalities have codes in place to regulate the amount of grease a commercial business can allow to filter into the sewer system. When too much grease enters the sewer system, the results often include grease clogged sewer lines, damage to pump stations and costly repairs for the local sanitary sewer department. When a municipality finds excess grease in a sewer line, they will trace the cause of the build up back to the source. If the situation is not remedied by the offending establishment within a reasonable amount of time, there may be fines imposed. The establishment may also, usually after a notice and hearing, have their owners permit revoked to operate a food-service establishment on the premises if they continue to create the potential for a sewer backup. Specific regulations and penalties for failure to comply may vary from municipality to municipality. We will need to know the following upon your call for service. What are the approximate dimensions of the cistern? What is the water level in the cistern? Will you be able to pump the water level down prior to our arrival? Where is the cistern located? 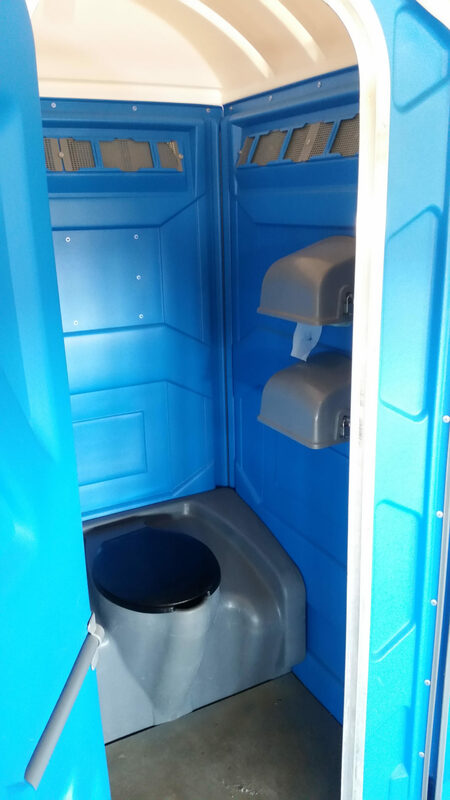 What type of access hole does the cistern have? One of the many services we at Mikes Sanitation, Inc. can provide is cleaning of car wash pits and interceptors, with sand & grit removal. The sludge is disposed of at our EPA Licensed Wastewater Treatment Plant. Call Mikes Sanitation, Inc. to help keep your car wash operation running smoothly. 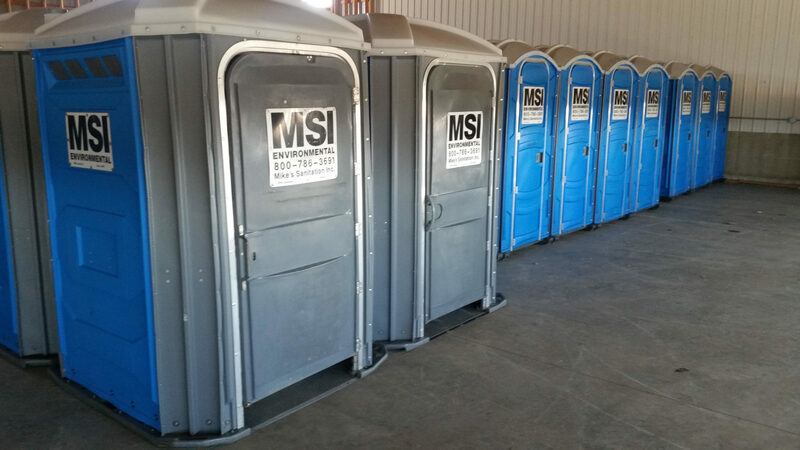 With over 40 years of experience in municipal, industrial, residential and agricultural waste, M S I leads the way. A real, live person will answer your call during regular business hours, building confidence and security. In after hour emergency situations we can be reached by following the phone prompts provided. Our commitment to prompt, courteous service leads to long lasting, mutually beneficial business relationships with our customers. We know that it is not what we do, but how we do it. Our customers can feel free to contact us at any time. 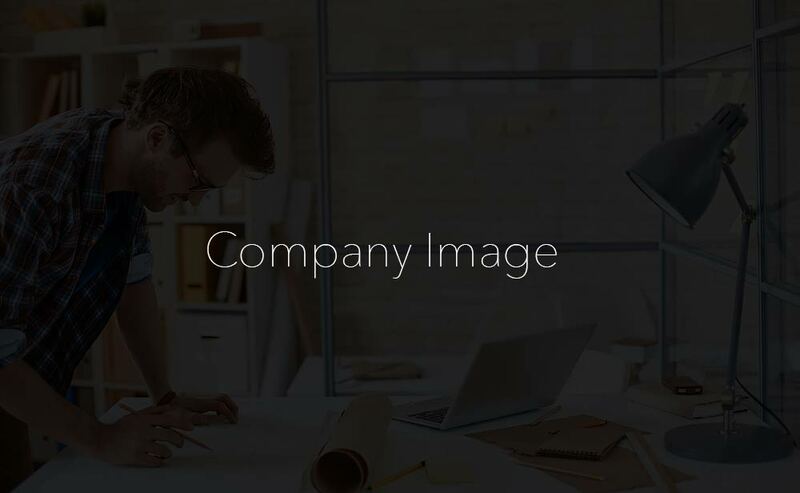 If you are having problems with your operations, we may be able to help. We have worked with numerous Industries and Municipalities to solve a wide variety of problems. 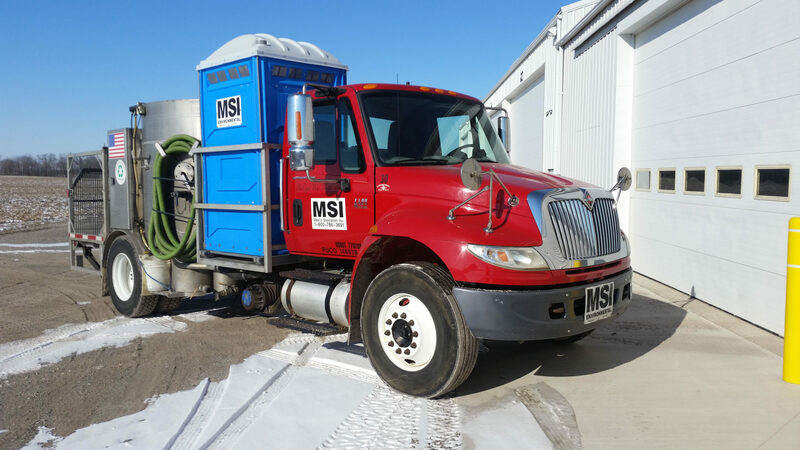 For many years now, we at Mike’s Sanitation, Inc. have run our own EPA licensed Wastewater Treatment Plant for municipal, industrial and residential waste hauling and disposal. Unlike most of our competition, we have the equipment and manpower to accept large amounts of wastewater in a short time regardless of the weather. We can haul faster and handle emergency situations with our modern, up to date fleet of semis and large straight trucks. Pumping is accomplished quickly with our four or six inch hoses and the largest vacuum trucks around. We strive to meet and exceed our customer’s needs by providing prompt, efficient removal and disposal of municipal waste, industrial waste and residential waste. We are proud of our perfect record with the EPA. 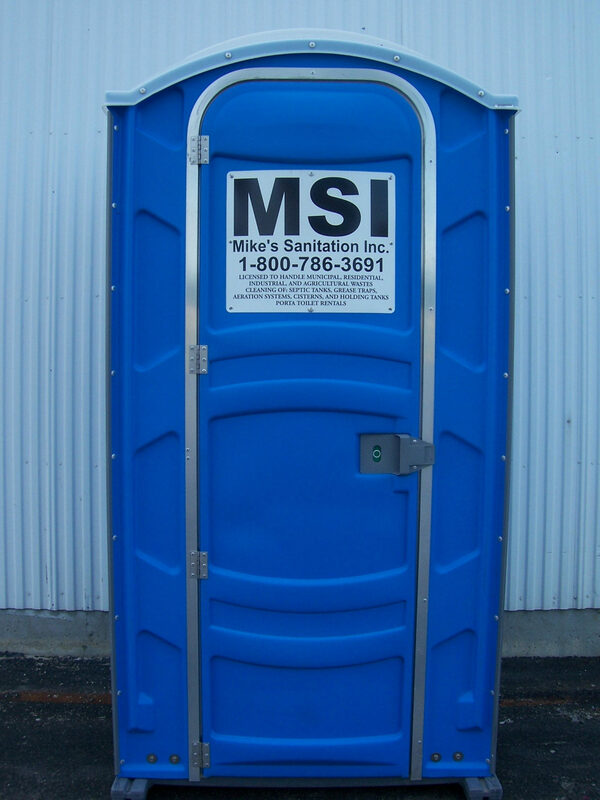 When the EPA questions our customers about their disposal practices, they can confidently say “M S I”. Municipalities and industries often utilize our services for sludge and leachate removal and disposal, grease trap maintenance for local businesses, as well as sand and grit removal and disposal. We also provide pumping of sand traps, trash traps, sanitary sewers, pump stations, digesters, lagoons (including lime treatment plants), interceptors, holding tanks, septic tanks and liquid waste with disposal at our EPA approved Wastewater Treatment Plant. *Municipalities utilizing our services can benefit from decreased paperwork, risk and liability associated with EPA requirements. Some septic systems are equipped with an effluent filter. If your system is equipped with an effluent filter, maintenance cleaning of the filter is necessary at least every three to six months. Not cleaning the filter can lead to system backups. To clean the filter you will need remove it from the tee baffle and hose it down. After that, install the filter back into the tee baffle. If you prefer not to be bothered with this task, we provide our customers in doing a thorough & professional job and can do maintenance cleaning of the filter on a regular schedule for a moderate cost.